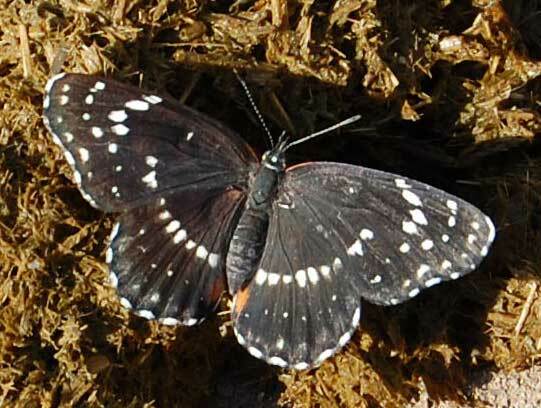 To this butterfly seen in the Spur Cross Ranch Conservation Area a pile of horse manure is way sweeter than a flower! Maricopa County, Arizona, USA. Oct. 2008. The lower wing patch can be narrow, absent, all white or bright orange-yellow. View some Border Patch color variations on Bruce Walsh's site. The submarginal spots are usually white, whereas the spot of California Checkerspot (Chlosyne californica) are normally orange. The spiny caterpillars can be found on various plants in the sunflower family (Asteraceae) such as Annual Sunflower (Helianthus annuus).